Obstetric specialists Dr. Wendy Gore-Hickman and Dr. Emmanual Yeboah were recently involved in a million-dollar delivery. The pair took their skills and $1 million worth of used medical equipment from a Saskatoon warehouse to the west African nation of Ghana. Gore-Hickman, an anesthesiologist, and Yeboah, an obstetrician, are part of a team creating a “centre of excellence” for obstetric care in Ridge Hospital in the capital city of Accra. “We’re helping to teach their specialists. We have dedicated ourselves to this program,” said Gore-Hickman, who returned recently from her second trip to Ghana. Gore-Hickman and Yeboah, a native of Ghana who has worked in Saskatoon for more than 25 years, taught local staff and hosted seminars on various elements of obstetric care. Their stint was part of a five-year commitment by the American organization Kybele to improve care at the hospital. Doctors from around the world volunteer and pay their own way to serve there for varying amounts of time. In Ghana, 750 out of every 100,000 women die during child birth, compared with seven in Canada. The numbers of babies in Ghana who die during delivery is similar, Gore-Hickman said. Many of these deaths are preventable with proper care and equipment, she said. “We also learned an amazing amount. Their physicians don’t have the resources,” she said. To improve the quality of equipment used at the hospital, the doctors teamed up with the charity Canadian Food for the Hungry International (CFHI). CFHI’s main warehouse is in the west industrial area of Saskatoon. The 13,500-square-foot facility is jammed with used X-ray machines, incubators, high-tech beds, wheelchairs, dozens of boxes of linens and other supplies. In the past eight years, CFHI has sent millions of dollars worth of medical equipment to Burundi, Sudan, Ukraine and many other countires. It receives the equipment from hospitals and health districts across Canada and sends it overseas with doctors, church groups, or others. A biomedical technician repairs or refits the equipment before it’s sent overseas. Before leaving Saskatoon, CFHI loaded a container with ultrasound machines, anesthesia machines, breathing bags, suction equipment, beds, gloves and many other pieces of badley needed equipment. 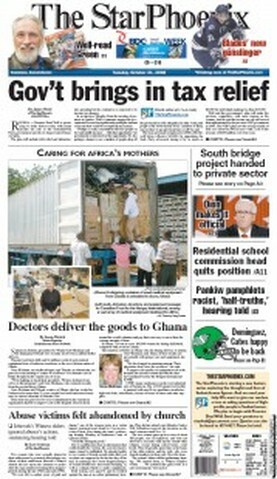 Gore-Hickman and Yeboah’s colleagues came up with much of the $11,000 cost of the container. CFHI inentory manager Judy Johnston traveled to Ghana with Yeboah and Gore-Hickman, and said the equipment and the doctors’ help will save lives. “It’s going to make a real difference for these young moms and their children. I really saw that,” Johnston said.